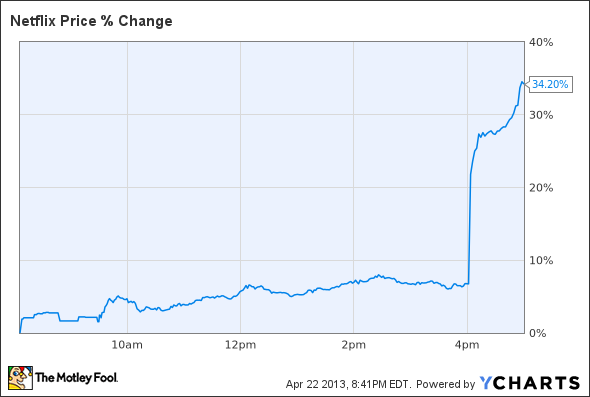 Following the results, as shown by the chart below, shares of Netflix, Inc. (NASDAQ:NFLX) surged higher. This move is impressive considering the fact that Netflix, Inc. (NASDAQ:NFLX) shares had already moved higher by more than 67% over the previous three months. At this point, given the move higher in Netflix, Inc. (NASDAQ:NFLX) shares, it is likely to late for short-term investors to profit from Netflix, Inc. (NASDAQ:NFLX)’s strong earnings. However, there is another stock, Coinstar, Inc. (NASDAQ:CSTR) that investors can trade off of the Netflix, Inc. (NASDAQ:NFLX) results. Noted short seller hedge fund manager Jim Chanos has been shorting Coinstar, Inc. (NASDAQ:CSTR) for a while now. Chanos believes that the business is in trouble over the long term because DVDs will eventually become obsolete as consumers switch to only streaming media. Chanos has been, without a doubt, one of the best short sellers in history. Chanos famously bet against Enron prior to the company’s bankruptcy. More recently, Chanos was one of the early investors to spot the housing bubble in China. Simply put, as an investor, you want to be on the same side as Jim Chanos. Netflix’s results are proof of the short thesis that streaming will be the way of the future. Of course, this is very bad news for Coinstar, Inc. (NASDAQ:CSTR), the operator of Red Box, the DVD rental machines often found outside of local supermarkets. The 2 million streaming customers that Netflix just added were likely previous customers of Coinstar, Inc. (NASDAQ:CSTR). As shown by the chart below, Coinstar, Inc. (NASDAQ:CSTR) shares are higher over the past six months despite the massive rally in Netflix shares. This correlation does not make sense. There should be an inverse relationship between these two stocks because what is good for Netflix is clearly bad for Coinstar, Inc. (NASDAQ:CSTR). Investors holding shares of Coinstar should look to sell following the strong results coming out of Netflix. I am aware that Coinstar is a cheap stock; Coinstar currently trades at just 9 times forward earnings. 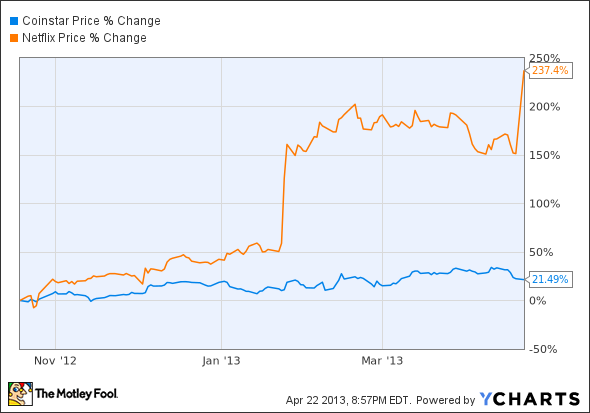 I am also aware that Coinstar is a heavily shorted stock; current short interest stands at more than 42% of the float. That being said the stock remains a sell because of secular developments. Netflix results show that the streaming business is stronger than ever and that is not good for Coinstar. While I think investors who are long Coinstar should sell, I am less confident that it pays to take a short position. While I believe any buyout is unlikely given the future prospects of the business, various rumors have surfaced over the past year regarding a deal. As Dell short sellers recently found out, it does not pay to short a company with poor fundamentals if a takeover is possible. I am not saying I expect a Coinstar buyout, but I think the odds are high enough that retail investors should not short the stock. The article Sell Coinstar After Netflix Reports Blowout Earnings originally appeared on Fool.com and is written by .